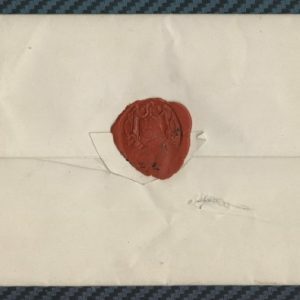 Every artifact that is a part of this Collection comes with a story uniquely its own, and this letter, acquired by the Curator of Papal Artifacts, is no different. 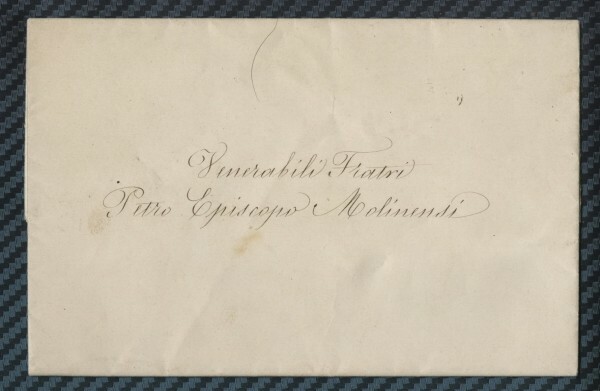 The letter was written in Rome and signed by Pope Pius IX on July 16, 1870. 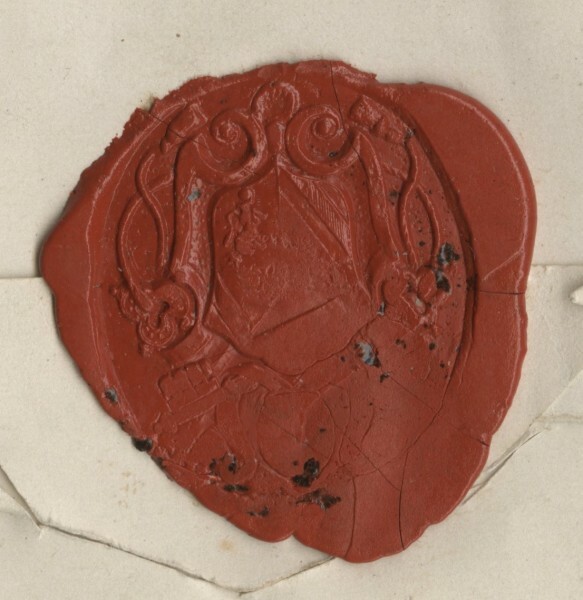 It was written to Bishop Pierre de Dreux-Breze, Bishop of Moulins. The most intriguing part of this special recognition by the Pope is the timing: it was written the day before the Dogma on Papal Infallibility was pronounced at the First Vatican Council. 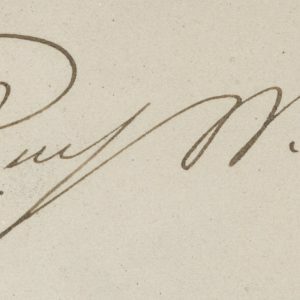 Known to be a controversial topic that was not supported by all Council participants (among them, Cardinal John Henry Newman), the Pope needed bishops to come to his aid, and the Bishop of Moulins is one who did. There is speculation he may have given a speech, during the time leading up to the vote, encouraging those in attendance to be in support of this dogma. 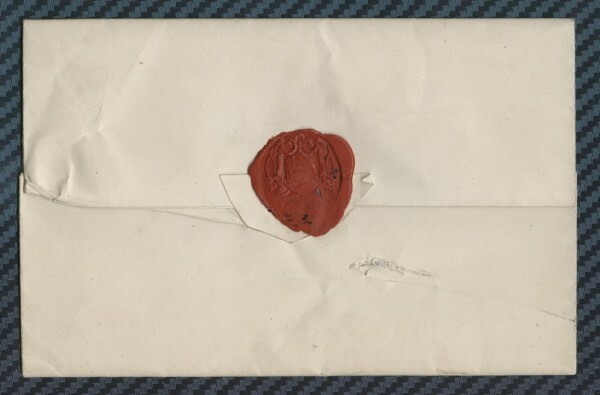 Consequently, it is surmised the Bishop was rewarded with this communication, signed by Pope Pius IX, on the day before the dogma of infallibility became the law of the Church. Unlike today, when information is dispersed in such a timely manner, at that time, there must have been frantic activity to reproduce individualized copies of the dogma for each bishop to read. Having key bishops campaigning was a necessary component of its successful passage. Having access to such a communication is an incredible addition to this Collection. 4 motivated by pure feelings do not forget to express and witness to them openly to us. 11 the Authority of the Oecumenical Vatican Council. 25 entrusted to your care. 28 in the twenty-fifth year of our Pontificate. 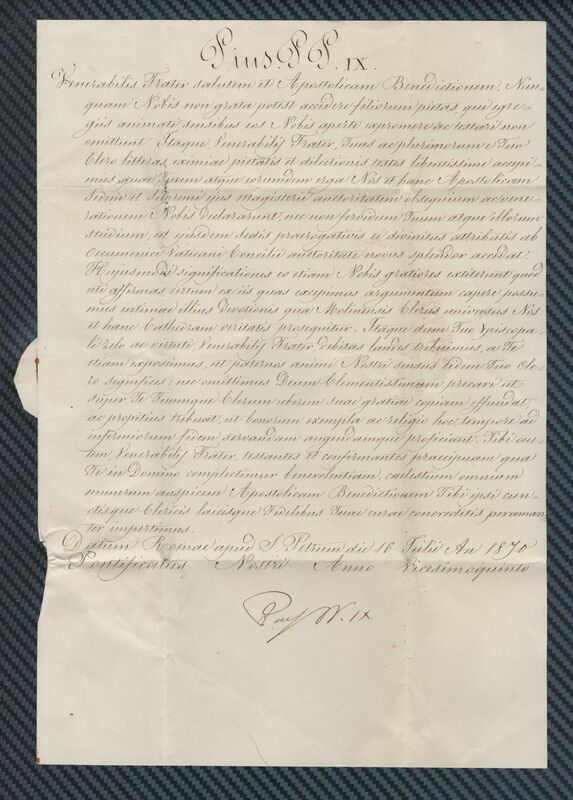 Papal Artifacts is grateful to Professor John Adams for his generosity in both the translation of this letter and his research into the probable reasons why this bishop was given such special treatment by the Pope. This council was summoned by Pope Pius IX by the bull Aeterni Patris of 29 June 1868. The first session was held in St. Peter’s basilica on 8 December 1869 in the presence and under the presidency of the Pope. The discussion and approval of the latter constitution gave rise, particularly in Germany, to bitter and most serious controversies which led to the withdrawal from the Church of those known as “Old Catholics”. The outbreak of the Franco-Prussian war led to the interruption of the council. It was in fact never resumed, nor was it ever officially closed. 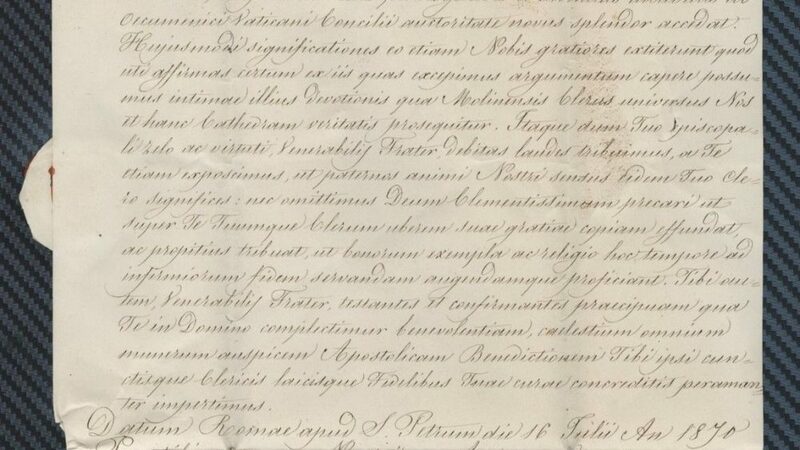 As in other councils at which the Pope was present and presided, the decrees were in the form of bulls, at the end of which was the clear declaration: “with the approval of the sacred council”. Very large numbers attended this council, including, for the first time, bishops from outside Europe and its neighboring lands. Bishops from the eastern Orthodox Churches were also invited, but did not come. The decrees of the council were published in various simultaneous editions. Later they were included in volume 7 of Collectio Lacensis (1892) and in volumes 49-53 of Mansi’s collection (1923-1927). 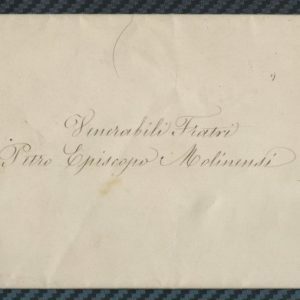 The collection which we use is that entitled Acta et decreta sacrosancti oecumenici concilii Vaticani in quatuor prionbus sessionibus, Rome 1872. Comparison with other editions reveals no discrepancies, indeed absolute agreement.